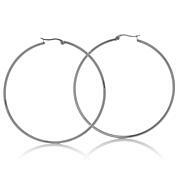 It's a staple of your jewelry wardrobe. 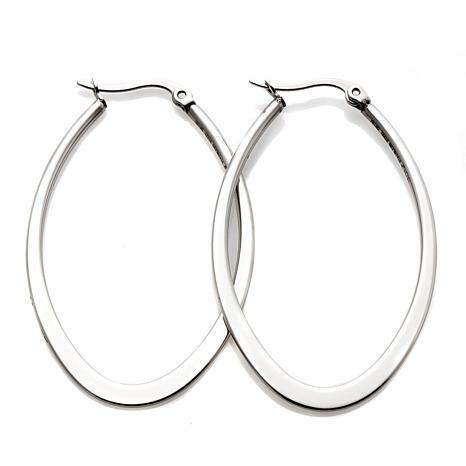 Every girl needs at least one set of hoop earrings. These work with almost everything in your wardrobe from fun to fashionable. Your biggest dilemma? Small, medium or large? These are just the right size. 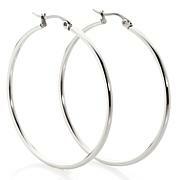 They are substantial but perfect to wear everyday. I would definitely recommend! Excellent quality, lightweight, perfect! I notice some reviews complain about size; I suggest reading the dimensions of the earrings and getting out a ruler to see size. If they are too big or small, it's your fault for not measuring. Look great, not heavy. Go to for everyday! This was a gift to my grand-niece, She is going to college in a w eek. She loved the earrings and wears them constantly. 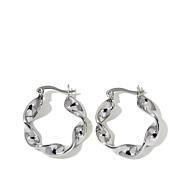 I bought these as a basic pair of silver earrings. They are perfect and light weight. I also had a coupon. I wish they had a gold pair.